Your choice of up to 80% of commissions Top commissions with leading air, cruise and land suppliers Technology tools to better manage your business Access to our exclusive point-and-click booking engine or through the Amadeus, Sabre or Galileo GDS systems Training, coaching and networking opportunities Innovative marketing programs to grow your business Exclusive cruise block space and supplier offers Lead generation for qualified agents Vacation.com membership included at no additional charge! It’s time to join a family of professionals that truly supports your independent business dreams. It’s time to join Nexion Canada. THE GATHERING – GOING LIVE! The DESIRE to travel starts early and continues throughout one’s life – are you marketing to Generation Z? Attention Suppliers: Advertising in SELLING TRAVEL reaches the serious business-minded travel agent. Promote your products and services using Selling Travel’s unique promotional formula – you write the articles on how to sell your own products offering step-by-step selling tips, tools and techniques that you know have worked for your agency accounts. Full page rates range from $300 to $425 based on number of insertions. Remember, if you can’t sell it to them, they can’t sell it for you! Please note that Selling Travel, owned and published by SMP Training Co, is not connected in any way to Selling Travel magazine published by BMI Publishing Ltd., and based in the UK. The latter publication focuses entirely on destination and travel/tourism product training and is circulated solely to the UK and Ireland travel industries. 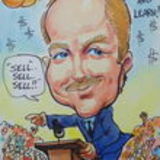 To benefit from this resource visit www.sellingtravel.co.uk and be sure to subscribe. 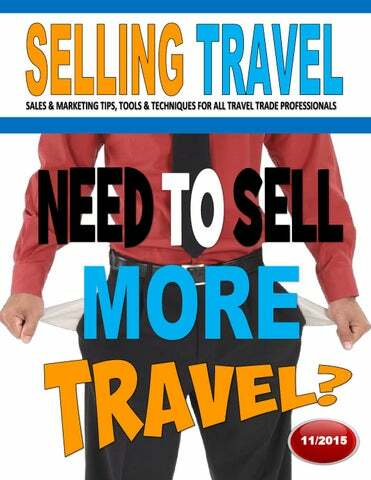 SELLING TRAVEL is owned and published by Steve Crowhurst, SMP Training Co. All Rights Reserved. Protected by International Copyright Law. SELLING TRAVEL can be shared, forwarded, cut and pasted but not sold, resold or in any way monetized. Using any images or content from SELLING TRAVEL must be sourced as follows: “Copyright SMP Training Co. www.sellingtravel.net” SMP Training Co. 568 Country Club Drive, Qualicum Beach, BC, Canada, V9K-1G1 Note: Steve Crowhurst is not responsible for outcomes based on how you interpret or use the ideas in SELLING TRAVEL. T: 250-738-0064. NEED TO SELL MORE TRAVEL? Of course you do. But then it’s a tough world out there, isn’t it? Not as easy as some industry gurus say it is. The most sought after skill set is creativity and how to tap into it. How to get new ideas that will point a prospect in your direction for more than three seconds. So in this issue of ST I’ve come up with a few weird ideas for you to ponder along with some universal advice and as always tips on how to do it. Then we have The Travel Institute offering its Financial Planning and Business Planning guides at a special rate – and every business pro’ knows – ya gotta have a plan. Some of the ideas cost money, others will take up your time, another will require you learn how to do something different and yet another is a slam dunk. It all depends on how committed you are to your selling career as to how you interpret the ideas and whether or not those pockets will be jingling with some commissions. Don’t forget you have a series of e-Guides you can purchase from The Travel Institute that will help you move ahead in most things related to selling travel. Here’s to your continued success in SELLING TRAVEL. Best regards. Steve Crowhurst, CTC, CTM Hon. steve@sellingtravel.net www.sellingtravel.net Top up your idea bank with this book! No matter what title you hold, if you work in a travel agency then your job includes prospecting and looking for new business opportunities. If you are in travel sales then you follow up on the opportunity you’ve discovered – if not, then you turn over your lead to your sales manager / team lead. From the junior travel agent to the home-based travel agent to the CEO and to the agency manager and accountant – everyone has a duty to prospect for new business and referrals. I know, prospecting is not the best activity in the world. Much better to file brochures, answer emails, post on Facebook and go for lunch. Besides the agency manager placed an ad that is supposed to attract all the business we need to pay the rent and salaries for seven people. Ya think? Remember naivety killed the cat. It will kill your career too. If you sell, you prospect. That’s the way it works. So let’s start looking for those new customers and referrals. Referrals Are There Waiting For You This is true. If you have even one client who has booked their travel with you that one person could in fact send you at a minimum, of one referral. Serve that referral well and that’s one more booking and a new client who can also refer one friend. Ramp up the numbers and see what the opportunities really are. You have 100 active clients. They can refer one couple. That’s two hundred prospects you didn’t have yesterday. Close ten percent and you have 20 new clients. And the thing is, they too can refer their friends and family to you. Asking for referrals is prospecting and instead of making a cold call / approach this is warm calling, because you know the client who is making the referral. Cold Calling / Prospecting If you do not, cannot make phone calls then your prospecting is limited to emails, posting on social media and placing attractive ads in your local newspapers and poster-sized callto-action images in your agency window. Wear a t-shirt with a CALL ME slogan and QR Code is also a prospecting method. Anytime you are “asking” and “attracting” you are prospecting. Better if you have completed your due diligence and know where and how you will prospect. A simple question: “Do you know anyone who is planning on travelling this year?” asked at a party or get-together will uncover the information you need. You might even get walked across the room and introduced to the traveller-to-be right there and then. Nice eh? Hi George how’s it going? Hi Kevin… well I just don’t know. No sales again this week… not sure what’s going on – and I spent over $200 on local ads to promote my group cruise and even placed a mug shot of myself too. After someone you know chats with you on the street. After a friend mentions a friend is getting married. After a party and meeting several like-minded couples / individuals. After someone comments on your Facebook page. During a client’s vacation. Three weeks after a client returns from their current vacation. After a customer trade show where attendees have completed a ballot. could include favourite dessert too. Now all you need is the image to go with that info. The Photo Shoot Tour Everyone is a photographer today and most travellers have some device to shoot a picture. Knowing this… you are steps and clicks away from offering a tour to the same old destinations, but this time instead of selling sun, sand and sea… you promote the photo shoot tour of… Let’s play this one out and think about that photo shoot wording and the connotation. You would normally imaging fashion models draped over a rock on a beach at sunset… and there’s no crime in that. However, what if you created the Photo Shoot for Young Lovers and head to Hawaii. The tour includes the most scenic spots for said loving couples to shoot images of their loved ones in and around unforgettable scenery. Keeping it real, you can promote, all you need is your smartphone… and post that socially so the word spreads virally. The Dreamy Come-On-In Image This image captures the very essence of something about the tour or destination you are promoting. That essence as it is intended here means to capture the ‘place’ in such a way as to have someone look at that image and dream of being there. Make The Colour Work For You As you may know, we humans intake information mostly through our eyes. Once in – the brain sifts and sorts between nice and spam. The nice usually starts off based on the colour of what we look at. Colour then plays a huge part in what we decide to buy. One of the most ‘wish I was there’ images is a sunset. After that, it depends on the audience you are focusing on and the niche you are promoting. The majority of working people with two weeks’ vacation a year might just be dreaming of lazing on that beach. The family might be focusing on a place for the kids and downtime for Mum and Dad… so a shot of the kids facilities might be an “Oh YESSS!” dream for the parents. The world of travel simply offers every colour combination possible and out of all of those colours – blue is everyone’s favourite according to a study by Crayola some years ago. Blue sky, blue ocean - yours to play with. In fact some people get a better email response when they convert the colour of their email text from black to dark blue. The activity hardliners are going to want to see the best image of what they do such as hiking, kayaking… cooking, reading etc. You can do it! And it’s one way to upstage the competition (pun intended) and get in front of 10 to 50 new prospects every time you stand up on stage and strut your stuff. Stuff meaning your travels, your images and your promotion. stage. It works to your favour. You’ll want to host your presentation in your agency if you have the room, in a hotel room, at the local library, book shop, movie theatre, in a restaurant which serves cuisine representing the country where your tour is going… and many other locations that would love to have you present there for a low rental cost. Timing is important and reflects the rental cost. Prime time anytime always costs a million bucks. A Tuesday morning from 9:30 a.m. to 11:30 a.m. is low cost. The POP UP Event I’m sure you’ve heard the Pop Up phenomena and any vacant store front on mainstreet could be where you rent and perform for the day. It takes planning as always to bring off an event, and perhaps a little more than usual as there will be “hotel team” to assist. Assuming the store front is empty you’ll need to rent chairs for the audience, plug in the coffee maker and lay out the cookies. If the wall is white, then you can project on to it, if not, then you’ll need a screen. After that you use the enter window of the store to market your event. Read more on POP UP stores and see if the concept can work for you. If you are homebased without an agency to work from this POP UP location could be a winner for you. Words to the wise from the many companies that are now in the business of helping you set up a pop up is this: always select a prime location when looking for an empty store. You want heavy foot traffic and that will come based on your location. Even if you own and run a travel agency, the POP UP concept can still work for you. There was a time when a coach tour company would park one its cutting edge coaches outside your agency or on a downtown site such as outside the local library. Financial Planning & Business Planning Ebooks Offer Key How-Tos Count on this information to help your business grow Key elements to your success as a travel professional include the ability to evaluate the financial strength of your business and to analyze new sales opportunities. Could you use some help with your budgeting and forecasting? Let The Travel Institute help you master these challenges with the Financial Planning and Business Planning ebook bundle. The information contained in these ebooks will help you develop a sound business plan, manage your cash flow, and help you forecast your business’s financial future. The regular bundle price is $95 but we're making this special offer for only $69! Travel Institute members save an additional 10 percent. Click here to order and download your bundle today. “Without a Plan you Plan to Fail!” Check out this Special Offer from TTI. As Facebook is FREE to open and use…you might want to consider investing five bucks or a little more, go for twenty bucks and use that moola to boost your next post. Chances are you’ll be able to reach an extra few hundred people who might click and LIKE your page or better still, they might click all the way through to you e-mail and request something. Could be information, a brochure or even a booking. That would be nice. You know you want this to happen – so break out a few dollars and invest in yourself. Now THAT is a very clever QR Code. And someone out there will say the magic words, “I’ll drink to that!” Knew it was coming. Then take a look at the column of QR codes from all over the place… shown as portraits, others multi coloured. There’s no end to the creative use of this QR code image. If you are publishing anything in print – a brochure or a hand out, then it MUST have a QR code on it and for obvious reasons. Do not fall into the trap of saying, but not everyone has a mobile phone or a scanner app. The people that matter to your agency, do! I tried the QR Code Generator as shown here to test out the colour option and the fact you can also embed your logo. Here’s what the generator produced for me There was a warning to check if your coloured code can be scanned – so do make sure you test your QR code before having it printed on thousands of brochures. Where or wear… it’s a play on words. You have to wear your brand but where do you wear it? In a world of hi-tech, this low-tech marketing idea still pays off. In essence you are going to become the brand and wear your marketing. I know some TAs baulk at this type of “thing” as they say, however you should be, must be, proud of your business, its name and be confident in wearing it. If not, then we have a serious problem and disconnect as to what you are doing with your travel selling career. The simple fact of the marketing matter is that you want and need people around you to know who you are and what you do and what you have to offer. It’s that kind of business you are in. Just like your brothers and sisters who sell real estate… they are pictured everywhere, or so it seems. You can wear your brand or have it “worn” as in positioned and posted on other media such as bus stops, on your car and as I say, on your person. Where to Wear With 80+% of the retail travel trade represented by women we should review how and where women can market themselves wearing their brand. So here we click to fashion for a moment. Sometimes tough to add brands and logos to your business attire. On the other hand some companies favour a certain colour scheme which can be marketed just like a brand. My days as a VP Training & Development with Uniglobe taught me all about colour recognition. If your agency is business casual or casual and that could range from a blouse to a sweat shirt or fleece, well the latter are prime for having logos printed or sewn into them. Ball caps too. You wear these branded items at the office, going home, when out for a walk and doing what you do after hours. The logo does get read. Your Sales Through Specialization Way back in 1970, comedian Flip Wilson appeared on shows such as Ed Sullivan, to perform his famous skit where, as housewife Geraldine Jones, she explained to her husband that she didn't want to buy that new dress but "the Devil made me do it". Just downloaded a new app to my iPad and it allows you to take two photos, one serves as the background and the other the top image of which you can erase the background with your finger to reveal the image underneath. This leads to creative compositions of your selfies and your landscape shots, castle shots, oceanscapes and whatever can serve as a background. Of course we want to turn your creativity into new travel bookings. Here’s how this might work for you. The idea here is to turn your photos into something bordering on movie styled posters that you can place on your website, post to your social media and also if you have a travel agency window you can use, tape it up there too. All you are looking to do here is cause a response from people who see your poster such as the one with me starring in DINO! The Movie. The next thing you want happening is for your “movie poster” to go viral. For that to happen the imagery might just do it, or the slogan you add to the large white band under the image might cause a response. “Visit the land of the Dinosaurs!” “They still LIVE!” “Why are you pointing at me?” “Come with us back in time…” Your poster could / should be promoting something in real time too. Could be a package to a theme park, or is there a tour of where the latest dinosaur has been discovered? Have some fun with your images the end result does not always have to be straight laced. Bend the rules and spark up the dialogue with your clients. Cause them to respond, with OMG! And WTDTFG! Which stands for “What time does the flight go?” Even here you can come up with some great acronyms to tease your clients. Go on give it a try! The Art of Colour Destination Marketing Here’s a fantastic new idea for how you can market a tour to a well-known destination. Put together a Colouring Tour of Paris for instance and you and your clients travel to Paris and colour in the pages of the latest colouring books for adults, plein air as they say. Live and onsite. Real time and real colours. Here’s the background: The world has suddenly found colouring books only not for kids, but for adults and they are being touted as adult stress relievers. Which is true. Like most activities that cause you to focus, your general daily thoughts, stresses and concerns are shelved for the time you are engaged in the activity and it is the same thing when colouring. My own attempt can be seen on the page opposite. The idea then is to select a book that matches your next tour or niche specialty such as Paris France or Tokyo, Japan as shown here. The other way to use them is to offer them as a post booking bonus to woo your clients and keep them engaged between their final payment and when they leave, in this case for Paris or Tokyo. I use the Faber Castell Artist Pen as shown above which is a pre-loaded brush pen and they come in a variety of colours. So easy to guide them in and between the lines. Hereâ&#x20AC;&#x2122;s where you find even more ideas on how to sell travel and boost your revenues. Ct is the destination information and how-to-sell trade magazine for travel agents and every article I write is always geared to new business generation for YOU and your suppliers. The content ranges from a step-by-step how-to article to a comment about a current topic. Many of the articles are worth reviewing with your suppliers should you be able to work together to generate that new dollar for all. Click here to read. Easy to read, no-fluff how-to marketing tips, tools and techniques. Each guide comes with a one-hour coaching session via Skype. You can preview and purchase any of the above guides from The Travel Institute. Be sure to join TTI and save on your purchases by using the member discount. CLASSIFIEDS Wanted: readers to click on this link and make money selling more travel. Looking for more fantastic graphics then click here for Presenter Media. Get what you need to start using video in your travel marketing & promotions with this guide. Animoto is the BEST and easiest DIY video creator. Try it today. When you need to write something and can’t – hire in a ghost writer like Steve Gillick. Steve produces scripts for your keynotes, webinars and brochures. Had enough of working for someone else? Would you like to explore how you can sell travel from home? If so then click on this link and explore. Your education station is right here. DIY Websites. This IS the Best of the Best. NEED GREAT GRAPHICS? Click here for GRAPHICSTOCK and save 83% on an annual subscription. Many graphics in Selling Travel are from GraphicStock. WANTED! DREAM MERCHANTS to complete a survey. Tell us about your passion for being a travel agent. Click here for information. Where travel trade professionals shop for new ideas. Big Bark has all your print-marketing needs covered! TOP 6 WAYS WE ARE DEDICATED TO THE TRAVEL AGENT: 1. Easy to use, do-it-yourself, 24/7 online print-ordering store. from our selection of pre-designed templates, or you can Design Your Own. extra charge. Over 1000 images to choose from! Thank you for choosing to travel with MyEscapades We take pride .com. in providing one-of-a-kind travel experienc in Africa, Asia, es Europe and South America. The majority of our clients require a trip customize d to their likes , interests and budget. Whe ther you wish to travel in the lap of luxury to indulge in or choose an authentic adventure (we call it ‘roughing will create a -it’) we trip to suit yo ur preferred tastes. In oth we will give e r words, you a travel experience that goes beyond expectations. your Rest assured, MyEscapades .com is your traveling comp perfect anion. trip You involves canc ellation penalties in the unforeseen even that you canc t el/postpone your travel arrangements. Ensure that you aware of these are penalties. • Carr your y Out-of-Count ry Hospital/Medic al/Travel Insur Policy with you. ance • awar Be e of luggage restrictions as weight, size and type of suitc such allowed on the ases inter national and domestic fligh ts on your itine rary. Excess bagg age charges are steep and can caus e great incon venience • Ensu you re have obtained recommended or required inoculations. Cert are mandatory ain inoculations for areas. Your trave travel to endemic l agent will have provided full details. • Chec outkthe availabili ty of local ATMs in your destination and/ or purchase some local currency travellers cheq or ues. • Give family/friend s the contact information at hotels/lodges you will be staying during your trave Information on l. your accommo datio is provided withi n your documen ns ts. • reco We mmend that you put your newspaper subs cription on hold the duration for of your trip and have your mail colle cted held at your local by a neighbour or post office. • is alwa It ys recomme nded that you secure your hom e with a secu rity alarm before you leave. options for groups, weddings, and niches. as calendars and magnets, plus all of your standard business products business cards, envelopes, letterhead, flyers, and more. 6. All products available in small quantities (most as low as 25). SELLING TRAVEL www.sellingtravel.net If you could refer us to your travel trade colleagues, we’d really appreciate it. Many thanks.